I know I’ve said it before & for fear of sounding like a stuck record, vans have got so much better recently, it’s frightening. 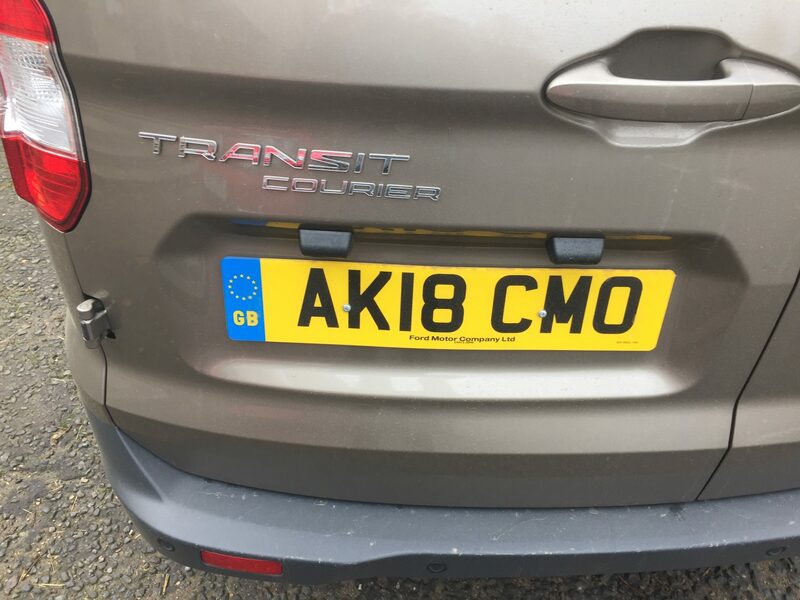 And, leading the way currently are Ford, who have completely changed, updated & improved their entire commercial range not once, but twice over the past 4 years. New Transit, Transit Custom & Transit Connect are here, plus the Transit Courier small van, all have been redesigned & relaunched & every one of them are excellent vans to drive with car-like cabins & specification. Take the Transit Courier which Company Car & Van drove recently. The Courier competes against small van rivals like the Mercedes Citan Compact, Renault Kangoo, Volkswagen Caddy & the platform-sharing Peugeot Bipper, Citroen Nemo and Fiat Fiorino. It’s more compact than the Transit Connect, is larger than the Fiesta Van & is pitched at operators who need to shift small loads in urban areas where compact size & a tight turning circle are the things most required. 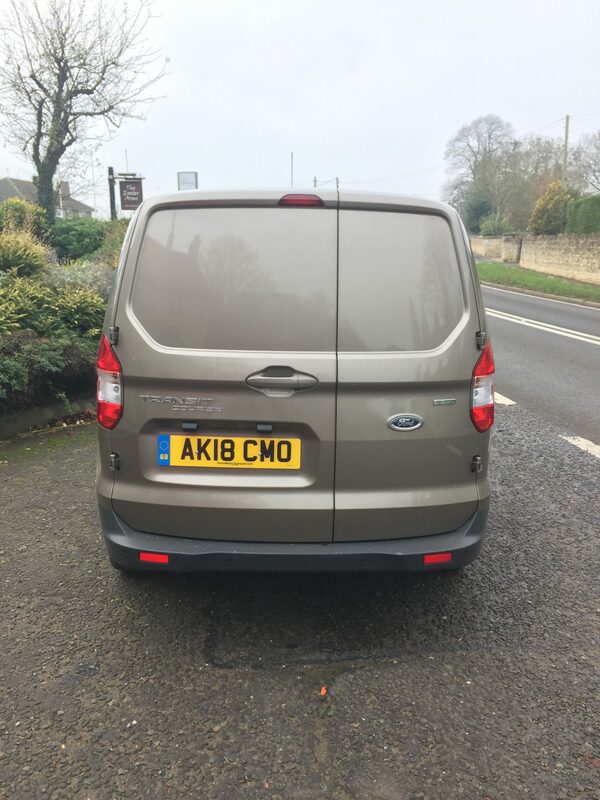 The latest model has been improved & upgraded by Ford. At first glance, it may not look that different from it’s predecessor, but the new model brings a refreshed front-end appearance that incorporates a reshaped grille opening & revised design for the lower fascia. 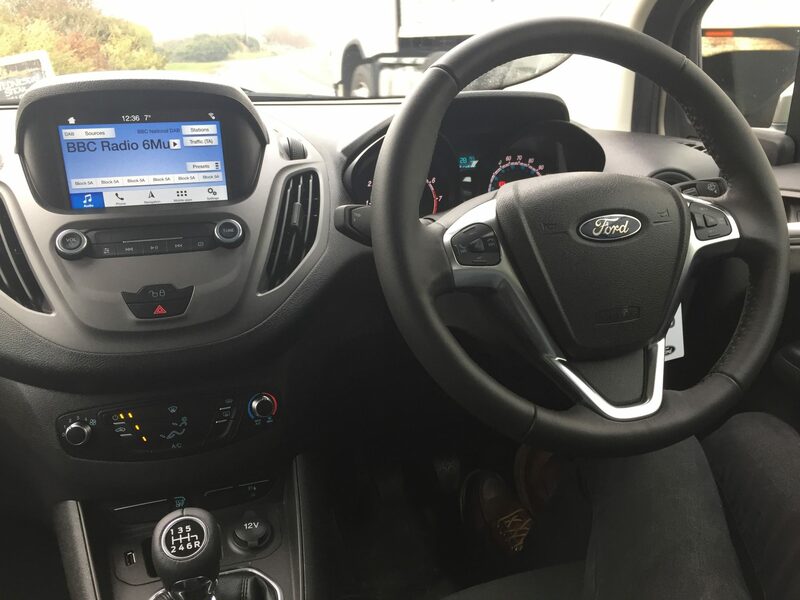 The cabin features a redesigned centre console, including a new, larger 6″ colour touchscreen with Ford’s SYNC 3 communications & entertainment system that is available on higher series models & it’s positioned closer to the driver, for improved visibility & ease-of-use. The updated powertrain line-up meets latest Euro 6.2 levels & offers customers the choice of a 1.5-litre TDCi diesel & a 1.0-litre EcoBoost petrol engines. All vehicles feature Ford’s all-new six-speed manual transmission, in place of the outgoing model’s five-speed gearbox, which contributes to better real-world fuel-efficiency & makes motorways more enjoyable. A new fuel-efficiency package is offered as standard on diesel models, which integrates optimised aerodynamics with an Active Grille Shutter that improves warm-up times & reduces aero-drag. New Transit Courier offers urban van operators a payload capacity ranging from 500-590 kg, load volumes up to 2.4 m3 (VDA) & a choice of van & kombi bodystyles. The series line-up now also includes a new Limited variant, providing customers with an alternative to the dynamic Sport model at the top of the range. Below these you can choose from a Base & Trend model, with the Limited the model that CC&V got to try. The Courier’s asymmetrically-split side hinged rear doors open to 158 degrees & the optional sliding side doors provide impressively wide access points to the rear. There’s also six tie-down points. The Transit Courier has a 1.9m3 metre load volume & a gross payload of 535kg. 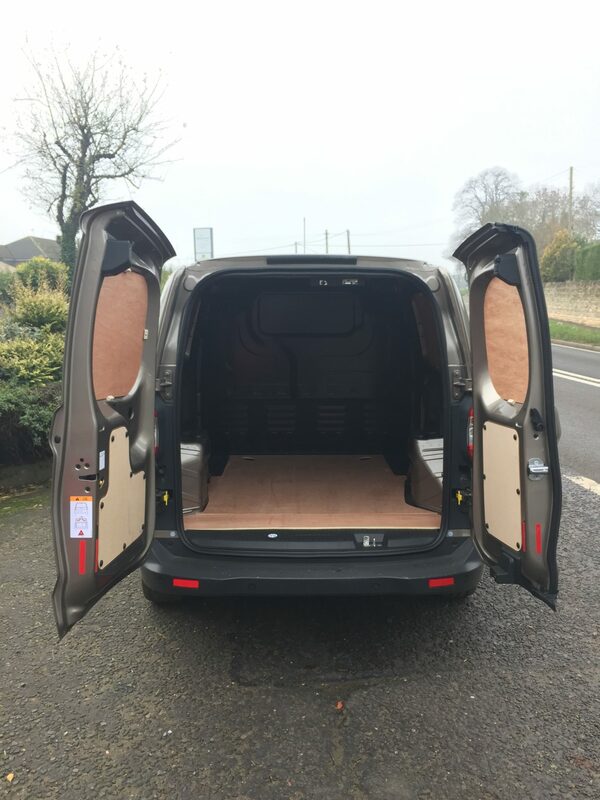 The load bay really is generous with a 1620mm maximum load length at floor level & 1012mm between the wheelarches so that a Europallet will fit in. With van manufacturers seeking ever lower C02 emissions for their vehicles & electric vans arriving from all directions, Ford’s 1.0 petrol EcoBoost engine fitted to my test model is a real gem. The Limited offers the customer 131g/km of CO2 with a combined economy of 48.7mpg, which at first glance , may seem poor when compared to a diesel. However, as the Courier by it’s size, is designed to be driven in local or urban areas, the figures are actually pretty attractive for driving in the city, many of which throughout Europe have recently banned diesels. The new Limited model that I was testing, adds to this long list, body colour front bumper & upper rear bumper end caps, body colour door handles & mirrors, air-con, rear parking sensor, auto headlamps & wipers, cruise control and adjustable speed limiter, SYNC 3 with 6″ colour touch screen & DAB, Side load door track cover & 15″ alloys. Out on the road & driven unladen, Fords excellent 1.0 litre EcoBoost engine is really quite something. 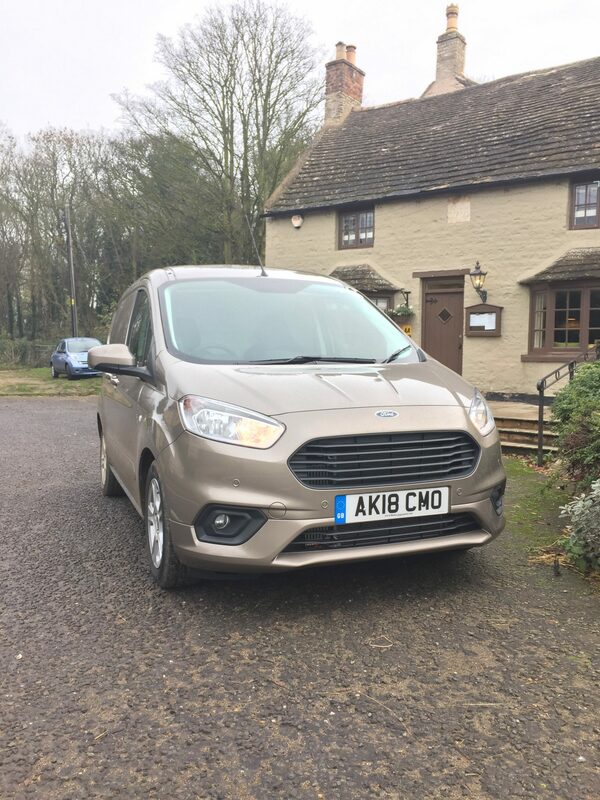 The 100PS on offer gives this small van a bit of oomph & with it’s six-speed set-up, it’s even good on the motorway. It’s compact size & measurements make it easy to manoeuvre & park & sitting in the ubiquitous stop-start city traffic, the Courier’s cabin is a comfortable place to be stuck. The Limited features a DAB Radio & SYNC 3 (Ice Pack 36) , which includes the 6″ Colour touchscreen, SYNC Emergency Assist, USB connectivity, iPod functionality & Bluetooth hands free connectivity. The addition of this to me, seems like a no brainer. Whether in town or out, being distracted at the wheel is dangerous & any forward thinking CV operator will see the benefit of a hands-fee mobile phone option. Having driven all of the other vans in this sector, the latest Courier is the one of the best of them. Not only does it drive really well, have a simply laid out quality interior & dashboard, but it’s very practical too. Space for the driver & front passenger are far better than you’d expect in a van of this size. There’s also plenty storage space, with a deep storage bin between the front seats, large door pockets & a decent glovebox. In what has probably been the easiest van review that I have ever written, the Courier is tremendous. I may well have to stick up for the 1.5 diesel version here, it’s the one that I would choose, but there’s no doubting that the 1.0 litre petrol isn’t bad either. Whichever model you choose & there’s plenty of Ford Transit Centre’s to get one from, I promise that you won’t be disappointed. Transit Courier Trend 1.0 EcoBoost 100PS stg 6.2 £15,126.36 + vat.